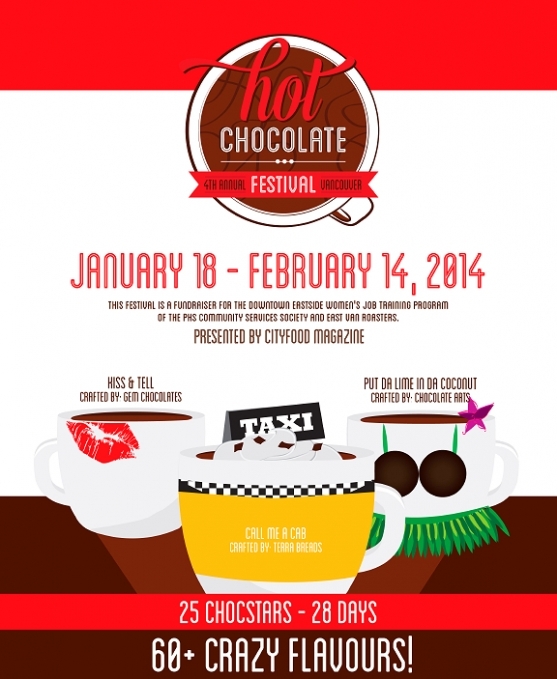 The 4th annual Vancouver Hot Chocolate Festival 2014 present by CityFood Magazine between January 18 – February 14, 2014. This year it features an exciting line up of chocolate makers who have come together to present you the wildest, most delicious flavors imaginable! 25 CHOCSTARS / 28 DAYS / 60+ Crazy Flavors: So what are some of these crazy flavors you ask? Bella Gelateria‘s gelato guru James Coleridge will present gBARs frozen gelato on a stick with flavors like salted caramel, black sesame, matcha, etc all served with Erin Ireland’s “To Die For” Banana Bread. Beaucoup Bakery‘s Dark Chocolate with black pepper. CocoaNymph‘s 64% dark chocolate with parmesan. Be sure to visit one of the participating chocolate makers to celebrate Valentine’s Day with your loved ones over a cup of hot cocoa! 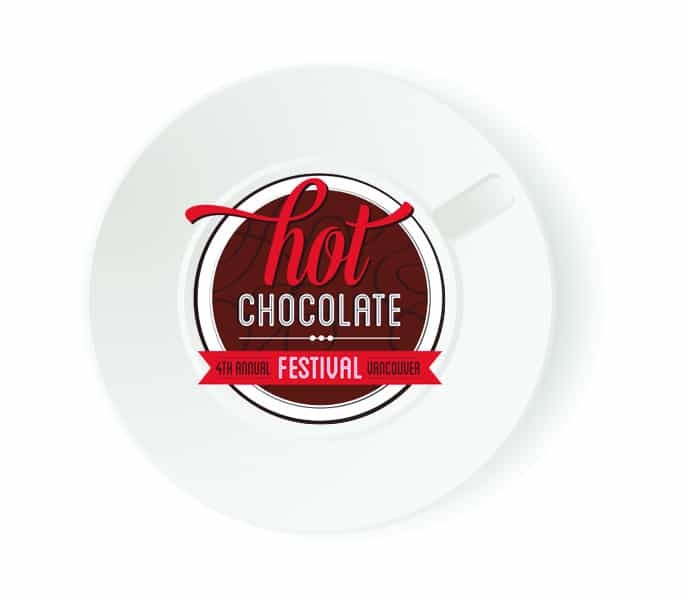 For a full list of chocolate makers and 2014 Vancouver Hot Chocolate Festival flavors, please see below! #11 – “MINT TO BE” An organic peppermint tea infusion made fresh to order and combined with Belgian milk chocolate. The result is a thinner consistency hot chocolate with a satisfying, classic milk chocolate flavour that is refreshing because of the cooling mint tea. Served with a mini chocolate croissant. Available: every day of the Festival. #12 – “MY FUNNY VALENTINE” A 50% dark Belgian chocolate with ginger. The chocolate melted and blended fresh to order with steamed milk and ginger syrup. Served with a mini chocolate croissant. Available: every day of the Festival. #60 – “SOUR CHERRY TISANE” Cold mocha rooibos tea, sour cherry and Pedro Ximénez cordial, Bittered Sling orange and juniper bitters. Served with zeppoli (Italian doughnuts!) Available: all day, every day of the festival. #61* – “THE BLACK WIDOW” (*contains alcohol) Uva’s HC-inspired cocktail: reposado tequila influenced with cacao beans and coffee, Cherry Heering liquer, Amaro averna, Bittered Sling plum and rootbeer bitters. Served with zeppoli (Italian doughnuts!) Available: Available every day of the festival, from 11 a.m. to closing. #62* – “CHARTREUSE MILKSHAKE” (*contains alcohol) Uva’s HC-inspired cocktail: Citadelle gin, green Chartreuse, cacao beans, lime and orange juice, Bittered Sling Malagasy chocolate bitters, egg white. Served with zeppoli (Italian doughnuts!) Available every day of the festival, from 11 a.m. to closing. #08 – “THE EVITA” gBAR flavoured with salted caramel – Argentina style. Served with Erin Ireland’s “To Die For” Banana Bread. Available: every day of the Festival. #09 – “LONDON FOGGY” gBAR flavoured with vanilla and Earl Grey tea. Served with Erin Ireland’s “To Die For” Banana Bread. Available: every day of the Festival. #10 – “RED HOT CHILI PEPPER” gBAR flavoured with chocolate, cinnamon and cayenne. Served with Erin Ireland’s “To Die For” Banana Bread. Available: every day of the Festival. #13 – “PUT DE LIME IN DE COCONUT” Single origin Venezuela chocolate with organic coconut and kalamansi lime. Accompanied by a toasted coconut shortbread. Available: every day of the Festival. #14 – “A SNOWBALL’S CHANCE IN HELL” Single origin Mexican chocolate with Mexican chili poured over house made chocolate ice cream. Accompanied by a flourless chocolate cookie. Available: every day of the Festival. #37 – “Chocolat Glacé” Iced drinking chocolate. Served with a Gaufre de Liège waffle, along with a side of fleur de sel caramel or chocolate hazelnut spread. Available: every day of the festival that the shop is open. #38 – “Chocolat Glacé à la Cardamome” Cardamom flavoured iced drinking chocolate. Served with a Gaufre de Liège waffle, along with a side of fleur de sel caramel or chocolate hazelnut spread. Available: every day of the festival that the shop is open. #39 – “Chocolat Glacé à la Noix de Coco” Coconut flavoured iced drinking chocolate. Served with a Gaufre de Liège waffle, along with a side of fleur de sel caramel or chocolate hazelnut spread. Available: every day of the festival that the shop is open. #40 – “Chocolat Glacé à la Rose” Rose flavoured iced drinking chocolate. Served with a Gaufre de Liège waffle, along with a side of fleur de sel caramel or chocolate hazelnut spread. Available: every day of the festival that the shop is open. #23 – “BELLE DU SUD” Lavender-infused Valrhona Bahibe milk chocolate. Served with “Guimauve” (vanilla marshmallow). Available: January 22, 27 and Feb 1, 6, 11. #24 – “LORD OF THE HOT CHOCOLATE” Earl Grey-infused Valrhona Jivara milk chocolate (Valrhona Bahibe 46%). Served with a French macaron of your choice. Available: January 19, 25, 30 and Feb 4, 9, 14. #25 – “BEYOND THE MILKY WAY” Valrhona Araguani dark chocolate (72%), pear and almond milk (dairy free). Served with “Marocaine” (almond flour ball flavoured with orange blossom water (dairy free). Available: January 21, 26, 31 and February 5, 10. #33 – “TIGER MILK” White Belgian chocolate with cardimom, nutmeg and saffron. Served with customer’s choice of liege waffle, cheesecake, chocolate, or a scoop of Italian ice cream. Available: every day of the Festival. #34 – “NOISETTE” Praline Belgian milk chocolate. Served with customer’s choice of liege waffle, cheesecake, chocolate, or a scoop of Italian ice cream. Available: every day of the Festival. #35 – “JAMAICA KISS” Belgian Milk Chocolate flavoured with coconut, pineapple and rum. Served with customer’s choice of liege waffle, cheesecake, chocolate, or a scoop of Italian ice cream. Available: every day of the Festival. #36 – “BOHO SECRET” A 72% Dark Belgian Chocolate flavoured with peppermint, turmeric, honey and pepper. Served with customer’s choice of liege waffle, cheesecake, chocolate, or a scoop of Italian ice cream. Available: every day of the Festival. #41 – “PAULA DEAN WHITE TRASH TRAINWRECK” A 70% dark chocolate ganache with condensed milk, salted kettle chips, and vanilla whipped cream. Served with a 72% dark chocolate wafer. Available: January 18 – January 31. #42 – “CAFFE SHAKERATO CON CIOCCOLATO” Iced espresso and warm 70% dark ganache. Served with a chocolate covered lemon, orange or grapefruit citrus peel. Available: February 1 – February 14. #44 – “DARK AND SPICY” Made from 70% dark chocolate, cayenne, a shot of espresso and steamed milk. Served with four pieces of handcrafted chocolate pralines of your choice. Available: every day of the Festival. Closed Sundays and Mondays. #45 – “BIG BAD WOLF” A 38% milk chocolate flavoured with a blend of gingerbread spices and steamed milk. Served with a gingerbread cookie. Available: every day of the Festival. Closed Sundays and Mondays. #46 – “WINTER COMFORT” 100% pure hazelnut butter blended with your choice of milk or dark chocolate. Served with freshly made chocolate-dipped hazelnut biscotti. Available: every day of the Festival. Closed Sundays and Mondays. #47 – “SNOW WHITE” White chocolate and steamed milk, flavoured with peppermint and rose. Served with four pieces of handcrafted chocolate pralines of your choice. Available: every day of the Festival. Closed Sundays and Mondays. #51 – “GRANVILLE ISLAND GROCERY LIST” Inspired by the flavours of Granville Island, this is a beet and saffron hot chocolate. #57 – “THE CAMPFIRE” A classic hot chocolate, only with smoky caramel, smoked Hawaiian sea salt. Served with vanilla marshmallows.